Located in high-tech Silicon Valley, Santa Clara University is California's oldest institution of higher learning. SCU is a private university, rooted in Jesuit tradition, with nationally recognized schools and several highly rated master's degree programs. Santa Clara University offers challenging undergraduate curricula in business, arts and sciences, and engineering, as well as master's, Ph.D., and law degrees. 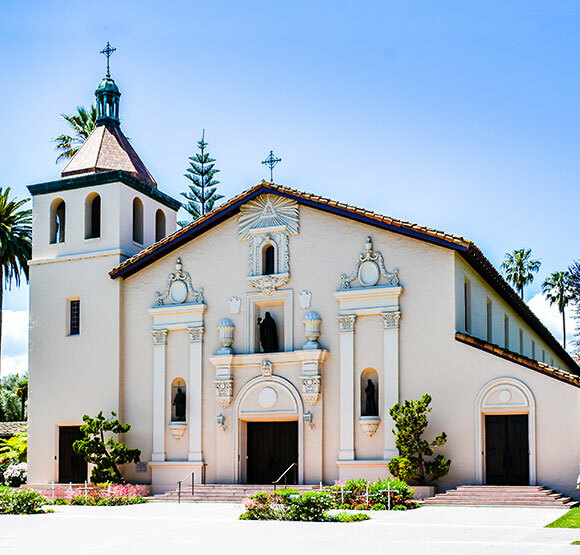 The beautiful mission-style campus is home to more than 50 buildings, including the Mission Santa Clara de Asis, de Saisset Museum, Center of Performing Arts, a television studio, state-of-the-art classrooms, and NCAA Division I sports teams. The campus hosts many events, including art exhibits, performances, concerts and lectures. Does the SCU campus offer tours? Yes. Guided campus tours are given by student ambassadors Monday through Friday and most Saturdays during the academic year. Santa Clara University also offers group tours and academic department tours. Group tours are offered Tuesday through Friday and select Saturdays (October through May), from 10:30 am-11:30 am. A counselor presentation and student panel round out a guided tour of the campus, buildings and facilities. Campus tours start at the Office of Undergraduate Admission in the Admission & Enrollment Services Building. Tip: arrive at least 15 minutes in advance to park and check in. Where is the best place I can park on campus? Santa Clara has two large parking structures and dozens of lots around campus. To park on campus, you must have a valid parking permit displayed between 6 a.m. and 8 p.m., Monday through Friday. You can pick up permits from the Main Gate kiosk at the University's main entrance. To print and view a PDF of permit locations, click here. A permit is not required on Saturday, Sunday, or University holidays.